Today is race day for the both of us! I will be running the Lucky Charm 10K later today and Lacey will be running a little race called the L.A Marathon. Guys, I think both of us have sort of been in a running rut because neither of us really trained like we should have. I was so excited to have a 10K be the first race of the year for me. I thought it would be a good distance. I wouldn't have to put in the time and dedication that I would for a half marathon (like I did last year), yet something more than a 5K would give me something to work towards. Like I mentioned previously, I wanted to use this 10K as a "goal race" since I was sick for my 10K last Spring, but I don't think that will happen. In any case, I'm anxious to see how it will go since it will be a "new to me race". I still got in three (pretty weak) workouts this week. 1) On Sunday I did 6 Run-walk miles on the trail with my sister. I'm definitely glad we got out and got some miles in. 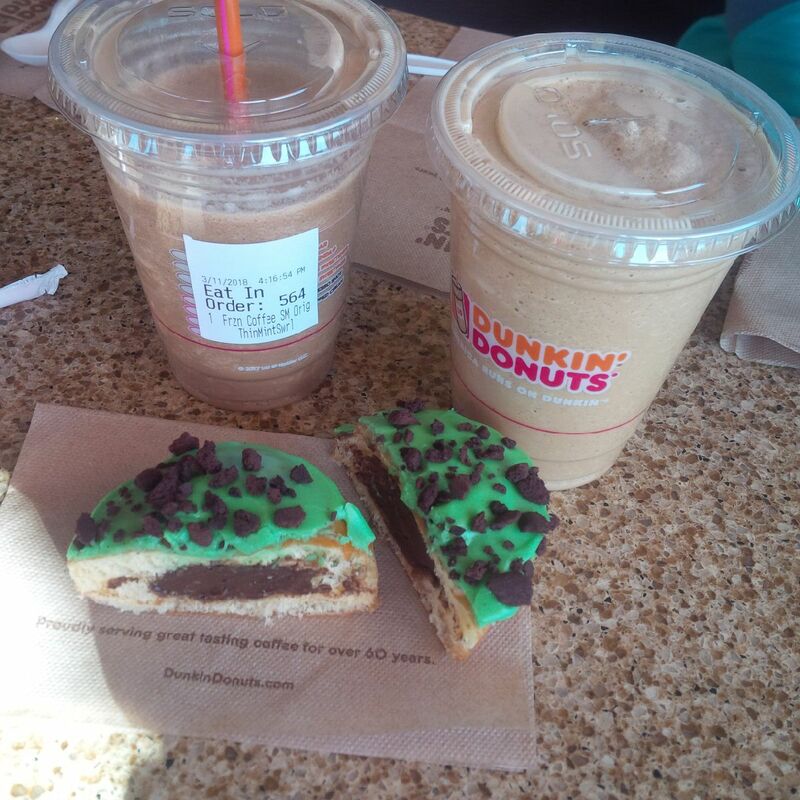 We treated ourselves to those yummy girl scout flavored coffees and split this mint brownie treat! 2) I did do a mid week strengthening session and actually spent an hour on the treadmill! I decided that since it takes me much longer to run the same distance on the tread than it does outside, that I would just run by time and not distance. I figured it should only take me about an hour to do the 10K on Sunday, so I just stayed on the mill for an hour just to keep my endurance up. 3) My last (sad) workout for the week was a 2 mile walk on the trail with my friend Heather who came to visit. She will also be running the Lucky Charm Race! What I plan to wear on race day. Your week sounds much like me. Hey, it's taper week! That's my excuse and I'm sticking to it! For my parkrun on Saturday we were encouraged to wear green but it was so cold only one person found something warm and green to wear! Hope your races went well. 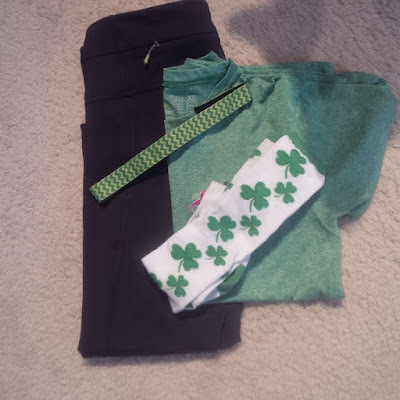 I also need to get some green running gear for those colder runs on St. Patty's day. All I have are t shirts. Thankfully that's all I needed today! I think it’s great to mix it up and run for time instead of distance. I also have never done a St Paddy’s Day themed race. I hope you had a great race and visit with Heather! Thanks for linking. Yea, I think I'm going to do that more often when running on the mill! It was a nice visit, thanks! Oooh, I'm excited to hear about your race! I love themed races (duh! ), and did another St. Pat's-themed race this weekend as well. How many St. Patty's races have you done now? Good luck to both of you! Can't wait to hear how the races went! And that donut looks delish! Thanks Sarah! I'm not a fan of donuts but I must say it was pretty tasty. The good thing about running a 10k is that the distance is manageable! Looking forward to the recap! Yea, it really is a good distance! I hope both of your races went well! I've never done a St. Paddy's themed race before either. I need to fix that! Thanks Deb! I hope you get to run one. Maybe next year! I hope you both had marvelous races! You are right, 10ks are not a real popular distance. I carried my own water but did not need it ( till after the race). I hope your race went well! St Patricks Day themes ones are fun. And it seems like the weather today is finally a little bit nicer for a change! The weather was absolutely gorgeous! Couldn't have asked for a nicer day! Hope your race went well! I've never done a St. Pat's race either. I'm sure it would be a blast! It was nice seeing so many people dressed up! It must the year. I feel in a rut too, but races make things fun. I hope you had a fun time. Yes they do! I'm actually looking forward to my next race now! I hope that the races went well for both of you! It was definitely a very busy race weekend! Yes, there seemed to be a lot of races this weekend! I hope your races went well! I'm motivated to train for the distance of my races, but not to push for a hard pace. I have to remember that on race day. Thank you! you always have so much energy in you! Thanks Deborah! Hope to share this week! I hope you enjoyed the race! The weather was beautiful !! Yes, we got really lucky! Can't wait to hear about your races! 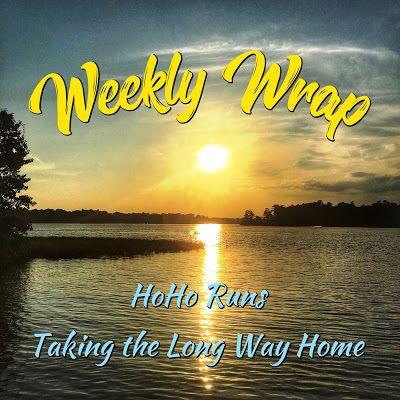 I'm not in a running rut, but feel like it since I'm giving my knees a break from some hard hiking I've been doing lately (the downhills kill me). Hope the race was fun! I hope the race went well and that it was a pretty weekend for you! I hope both your races went well! And what is it about the treadmill that slows runners down? Not all runners, I know - some are faster on the treadmill, but not me. I feel like I'm slow as molasses when I get on the dreadmill. Good call running by time instead of distance there. of fun! I don’t know what it is about this year but I’ve just been in a running funk. Both races were fun! It helped that the weather was great! I hope you both had great races this weekend! Can't wait to hear both race recaps! 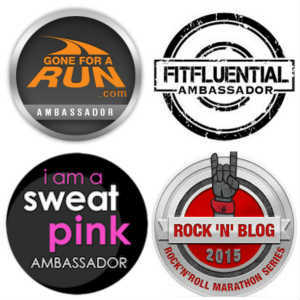 I think we all get caught up in those runner funks sometimes. I didn't get to do a St. Patricks' themed race today, but I hope to next year! 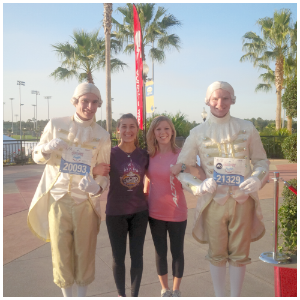 I like themed holiday races! Thanks! I thought the socks may be too much but I clearly needed more festive attire! Loved the St. Paddy's Day race I did. It was very festive and also had a parade afterwards. Great day weather-wise too. Can't wait to read about yours. Wait....did you do the Lucky Charm in Harrisburg, PA? THAT Lucky Charm? The Dunkin Donuts treats look amazing, by the way! Yes, that was the one! Did you run that one too?